and, of course, AngularJS and Ruby on Rails. We thought that this case was interesting enough to write about. If you're not sure how OAuth Implicit Flow works, it would be good idea to read this article first: OAuth2: the Implicit Flow, aka as the Client-Side Flow . It's a flow for clients that can't keep secrets - exactly what we need for SPAs. You can git reset our demo application to cfa3b69 to get this post-setup state and work on implementing the fun stuff with us as we go along. grape-doorkeeper is a fine little gem that integrates Grape with Doorkeeper almost seamlessly. We also know that we'll always be dealing with a trusted application and we don't need our users to accept it the first time they log in, so we set it to skip authorization unconditionally. Of course, this might not be the case for you. desc "Return all users' emails, doesn't require authentication"
I believe it's pretty straightforward. Now we need to tell Grape that each endpoint requires authorization. We'll also define some helpers in order to use them later. It's generally a good idea to move it to Defaults or some other shared module, but - since we have only one resource to protect - I left it here for the sake of simplicity. That's it for the back-end! 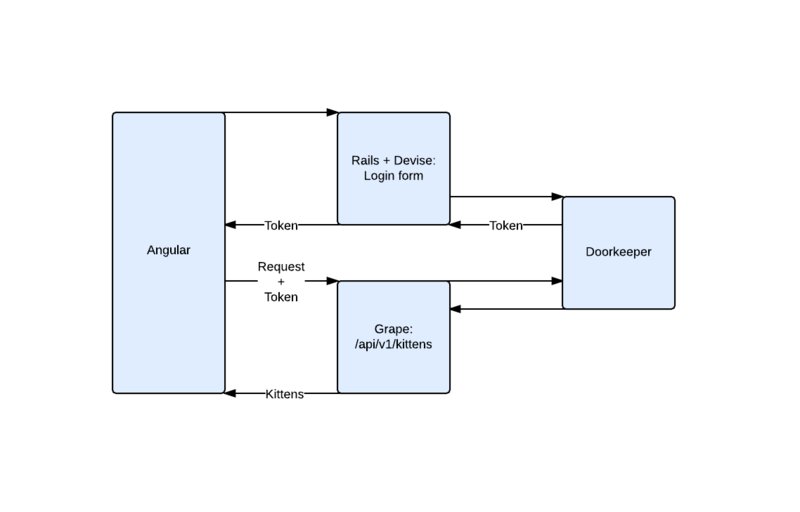 Now, we bring the real fun stuff: Angular and its interceptors. Let's create a simple service to store and retrieve our access token. It uses $localStorage to store it in a user's browser, but any cookie/storage solution will work. It means that we must create a route, then retrieve and save the token. Our AccessToken service doesn't have the ability to expire our token, but it's generally a good idea to implement this. 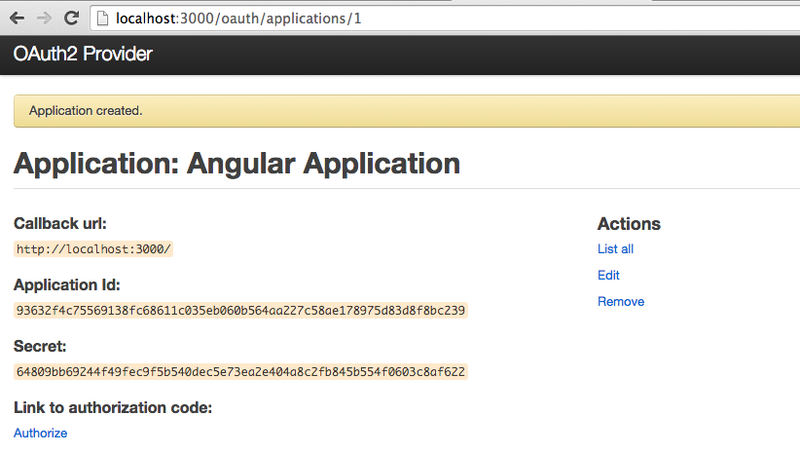 After all of this work it's finally time to create AuthCtrl to send the user to our login form. Remember that both client_id and redirect_uri must match with the application we created earlier. Sooner or later Rails will return you the 401 (unauthorized) error code. It's good to do something with it. We might, for example, redirect the unauthorized user to a special page, explain what happened and suggest to log in. That's it for now! I hope this post was helpful for you. OAuth Implicit Grant is probably not something you will be working on every day but when it finally presents itself, this article will have you covered. Thank you and - as always - we'd love to hear your feedback. We’ve been doing Ruby on Rails since 2010 and our services quality and technical expertise are confirmed by actual clients. Work with experts recognized as #1 Ruby on Rails company in the World in 2017 by Clutch.